The first time we saw Michael Bartels enter the F1 scene we weren't impressed. 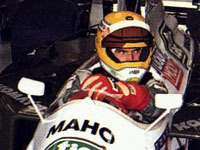 Come to think of it, in the three Lotus opportunities which followed after his home GP debut he didn't quite live up to the promise he left in German F3, his whole F1 career thus comprising of a string of non-qualifications. This effectively ruined his chances in the top category and left him looking for a drive in lesser series. Bartels turned into an Opel regular in German Super Touring, after showing well for Alfa Romeo when the big DTM cars were still powering across the German airfield tracks. Even after the defection of BMW and Audi he became a force to be reckoned with in the now defunct STW.